The best post-study employment rates are not found through university. Lauren Ahwan reports. VOCATIONAL education graduates are far better at meeting skills shortages than their university counterparts. 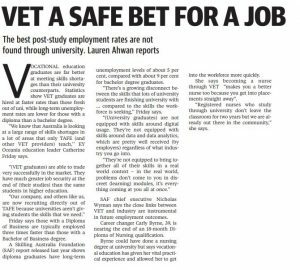 Statistics show VET graduates are hired at faster rates than those fresh out of uni, while long-term unemployment rates are lower for those with a diploma than a bachelor degree. “We know that Australia is looking at a large range of skills shortages in a lot of areas that only TAFE (and other VET providers) teach,’’ EY Oceania education leader Catherine Friday says. “(VET graduates) are able to trade very successfully in the market. They have much greater job security at the end of (their studies) than the same students in higher education. “Our company, and others like us, are now recruiting directly out of TAFE because universities aren’t giving students the skills that we need.’’ Friday says those with a Diploma of Business are typically employed three times faster than those with a Bachelor of Business degree. A Skilling Australia Foundation (SAF) report released last year shows diploma graduates have long-term unemployment levels of about 5 per cent, compared with about 9 per cent for bachelor degree graduates. “There’s a growing disconnect between the skills that lots of university students are finishing university with … compared to the skills the workforce is seeking,’’ Friday says. “(University graduates) are not equipped with skills around digital usage. They’re not equipped with skills around data and data analytics, which are pretty well received (by employers) regardless of what industry you go into. SAF chief executive Nicholas Wyman says the close links between VET and industry are instrumental in future employment outcomes. 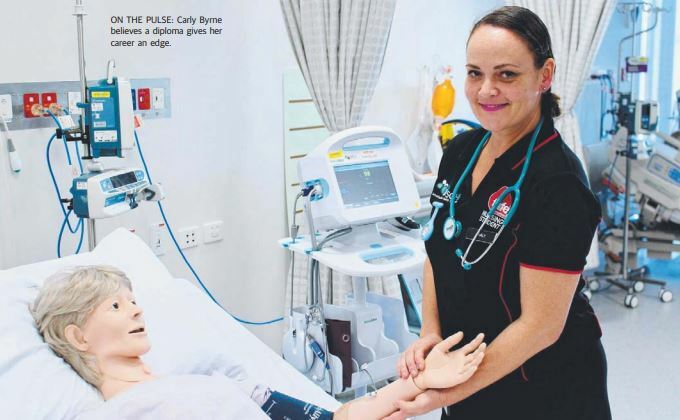 “Registered nurses who study through university don’t leave the classroom for two years but we are already out there in the community,” she says.